lt;stronggt;UNGNN140lt;/stronggt;lt;BR/gt;Unger Nifty Nabber Extension Arm w/Clawlt;BR/gt;Ideal for picking up bottles and debris including cigarette butts and other small objects. Also can be used to retrieve items from high shelves. Powerful, gear-driven claws and over molded fingers provide excellent gripping power. 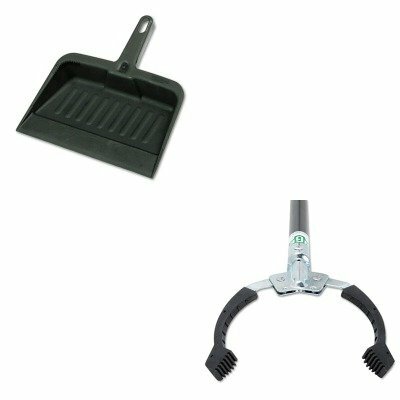 Materials: Stainless SteelNylonRubber.lt;BR/gt;lt;BR/gt;lt;stronggt;RCP2005CHAlt;/stronggt;lt;BR/gt;Unger Nifty Nabber Extension Arm w/Clawlt;BR/gt;Handy dustpan features a tapered front edge to help simplify sweeping-up. Heavy-duty, moderately flexible plastic provides commercial-grade durability. Lanyard handle-hole allows you to hang and store the pan out of the way. Material(s): Polypropylene; Width: 8 1/4quot;. ~ Includes one dustpan.